Who Is Currently On Your TV Communicating With America? It is the President of the United States of America. He is talking to American Citizens; utilizing the medium by which the majority of Americans get their news and information from: “The Mainstream Media”; about National Security Issues that he has to deal with today and everyday in order to protect this nation and its people from another major attack. The people who we select to govern our country must have the intelligence, experience, intuition, foresight and the ability to love and protect all of the people of this country that they have been given the privilege of governing-Not just a select few. President Obama has not chosen to talk to just his favorite American People, or to the only people that he considers to be Americans. Neither has he chosen to talk to just the people who look like, sound like, think like and act like him. No! He is talking to all of the people of the United States of America as one, in order to inform them, comfort them and to make them aware, (to the greatest extent possible), taking into consideration classified and national security concerns about what exactly is going on with the threats of attacks that our enemies are trying to inflict upon us. Do you want people to govern our country that do not have the qualities listed above? Do you want a leader or a Political Party that does not have the social skills, the civic skills or the social education and complex thought processes that it takes to deal with the kinds of security, economic, social, public health, public education and so many other demanding and complex issues that we are currently facing as a nation? Say no this Tuesday, November 2nd, 2010 with a vote to keep the current party in power. But do you honestly believe that these people who do not even want to talk to the “Mainstream Media”, which is where most Americans get their news and information from-And who do not even want to talk to; talk for or talk about anyone who is not just like them-Which is why they only want to talk To FOX New, Rush Limbaugh, Glenn Beck, Bill O’Rielly and others who are just like them- Do you think that they could effectively deal with situations such as the ones that we are dealing with at this very minute, and that we as a nation will be continuing to deal with after Tuesday’s Election. If you know that the answer is no. Then say no to The Republican/Tea Party on Tuesday, November 2nd, 2010 with a vote for Democrats. They used to say, “Don’t change horses in the middle of the stream”. Stay on the new horse with new insights, ideas and approaches. Don’t go back to that old broken down horse from the 18 and 1900’s. Please Vote Democratic Now! – If you have not already done so. Conventional Political Wisdom tells us that Michael Steel is the leader of the Republican/ Tea Party. Michael Steel is just the Black Figure Head that they placed on a pedestal, in response to President Obama’s successful 2008 election to the White house; to confound and confuse the members of the American Public who are socially and politically unaware of what is going on around them that either directly, or indirectly affects them and their families. Click here to see one of the real leaders of the Republican Party. And see it for what it’s worth. We are not where we want to be right now, but we are definitely not moving backwards, towards a country that exists only for the benefit of a few greedy, power hungry liars, who will say or do anything to get elected. 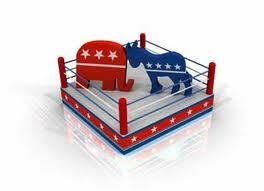 It is predicted that Democrats are going to face a blood bath on November 2, 2010. The only thing that can make this wishful thinking a lie, is your active participation in the political process. We have 8 days to consider the fact that there are very dark and powerful forces at work, that not only want to take this country back to Pre-Civil Rights, but they also want to go back to Pre-Woman’s Rights, Pre-Voter’s Rights, Pre- Disabled Citizen’s Rights, and in fact, Pre-Human Right’s, in favor of establishing a Plutocracy, where the only people who rule are the wealthy. These forces have also fooled many of their uneducated followers, who are poor, and blinded by hatred against people who are different than they are, to support them in their efforts to do so, based on the “Us Against Them Fear Mongering” generated by the Right Wing Conservative Media Machine, led by FOX “News”. We’ve come a very long way in this country as far as making this a nation of fairness and equality for all Americans no matter what their skin tone, beginning point in life, what they believe, (that does not endanger other citizens lives), or the size of their bank accounts, etc. However, these forces do not want this progress to continue, and will do anything, (including buying elections), to not only stop it in its tracks, but to totally reverse it. Please do your part to prevent this from happening by voting for Democrats Now! It Is Time For Us To Unite To Fight Our Common Enemy Who Is Trying To Make Anyone Who Is Not Wealthy, Unimportant In America. Don't Get Amnesia. Keep Your History Straight! I went to vote yesterday at the Library in Be Air, MD. Across the street from the election was a Republican/Tea Party. Man! These people are crazy and dangerous. I know we all have fun laughing at their ignorance and lack of social skills, but just remember that people laughed at Hitler initially also. And we all have heard about how that went. Vote against these fools while laughing. People who want Freedom, Justice and Equality for all of America’s Citizens need to act to prevent these racist and social attacks against all of the people who are not just like them, including our president. Vote while laughing on November 2nd, 2010-Or sooner if you can. Still Watching The Racist Nature Of America Being Uncovered Before My Very Eyes. Conservative: Keep things the same, as long as those things benefit us, and the people who are like us. Liberal: Create changes that benefit everybody. The One Nation March is over. It was a very moving experience to stand on the same hallowed ground where Martin Luther Jr, made his I Have A Dream Speech On August 28, 1963. This is also where President Barack Obama, launched his presidency on January 20, 2009. The thing to remember rather you were able to attend the march or not, is the fact that, your attendance and your vote for Democrats on November 2, 2010, in every race across this country, is an absolute necessity. We must not listen to “The Poles”, (that are manipulated to discourage those who would not be motivated enough to vote in the first place). FOX News, The Right-Wing Propaganda Machine, or any of our Socially, historically, Politically uninformed friends, neighbors or family members; (especially those who do not exercise their right to vote anyway). Many good people from all ethnic, social and economic backgrounds have fought and died for this right for woman and for African Americans and other minorities. And on November 2, 2010, we need your vote in order to replace the members of the House and the Senate, (both Democrat and Republicans), who are trying desperately to set this country back to the 1920’s, when only a chosen few were allowed to participate in our country’s Democratic Processes, and in the distribution of wealth and power. President Obama has made significant progress forward; even though his most racist critics will try to convince those who do not know any better, that the current economic recession which we are in the middle of, (which usually take years to create, and even more importantly, to reverse; (no matter who the current president is), is all his fault, and that it just recently occurred as a result of his election to the Whitehouse. This recession is the result of the Wars For Profits Schemes of The Bush Administration during their 8 years of attacks and deceptions against the many people of this country, in order to benefit just a few. To return to the practices and policies that only benefit The Chosen Few: The Republicans. Or, the practices and the polices that are designed to benefit the majority of people in this country who are not rich or powerful, and who are either just average middle class working people, children born into poverty, the sick, the elderly and the poor: Democrats. Please Vote for the Democrats on November 2, 2010. Don’t be fooled into moving backwards. 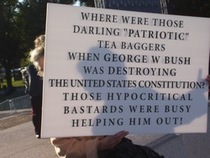 There is no “Tea Party”. Check your Local Elections Board. You will not see any Political Party identified as a “Tea Party”. They are the Racists who are more Racists than the so-called Mainstream Republicans are. If the idea of the United States of America becoming a RACIST SOCIETY appalls you; then vote Democratic on November 2nd 2010- or sooner if you can. We are now 14 days away from the mid-term elections that most people are taking for granted. Are you satisfied with the results that the Republicans achieved in the previous 8 years when they were in power? Are you satisfied with the murder of over 4400 Americans in Iraq as a result of a war for which the necessity has yet to be determined, or announced? Are you satisfied with the war that continues to rage out of control in Afghanistan? A war, which President Obama actually implemented an exit plan for, instead of staying indefinitely and losing more American lives, while making military contractors richer at the expense of our citizen’s lives. Are you satisfied with the fact that the Republicans are selling you out, by shipping jobs overseas, so that they can save their rich buddies money on labor cost-leaving our economy in ruins, and our citizens unemployed on a massive scale? Have you noticed who has been taking drastic actions to try and reverse all of the damage that has been done by the Republicans during their control of the Whitehouse? And have you notice who has been building up brick walls in order to block every progressive legislative agenda that President Obama has proposed? It has been the “Party of No”-The Republicans. Which is also now known as the “Party of Nuts”, since the insertion of the Tea Party, who only represents the few nuts who are like them, and no one else. This is why they cannot stand up to the scrutiny of the “Main Stream Media”, which is where most Normal Americans go to get their news. Yes! For those of us who voted for President Obama, much is expected, and this is a fair expectation, based on Mr. Obama’s campaign. Before you get mad about the success that we have not achieved yet. Please do so after considering the fact that this is not a Dictatorship, and that President Obama has been opposed and betrayed on both sides of the political fence at ever turn. That is what these Mid-Term Elections are all about. Removing the people from power who are constantly blocking the progress that we need to make in order to get this country and it’s people back on track. And replace them with people who are willing to work together as a cohesive unit, (Democratically Speaking), in order to return our nation to the nation that it is meant to be. Equal justice, fairness, and opportunity for all who are willing to work hard and to sacrifice for the things that they need and want in their lives, and in the live of their families. Please remember all of the failures that we have had to overcome just to maintain, and save our country from financial ruin. The amount of time that it takes to get out of a ditch depends on how deep the ditch is. The ditch that the Republicans dug for our country through racism, separatism, fear mongering, exportation of our jobs, and war for profit schemes that hurt so many; just so a mere few could benefit and profit, is indeed very deep. We are heading in the right direction, contrary to all of the lies that the Republican’s tell about the Stimulus Plan being a complete and total failure, while cutting ribbons celebrating successful projects made possible by the Stimulus. These hypocrites are even writing letters begging for the very Stimulus Money that they all unanimously voted against. Do not let them fool you! Unless own a major corporation or are in the top 2% or wealthy people in this country. And I am not talking about those who would like to be there, so much so, that they are kissing the asses of those who are. I am talking about you, who know that you do not fit into the category of wealthy. If this is you; then you need to vote early wherever and whenever possible, and you need to vote for all Democrats who support Democratic Causes. Don’t turn this country of to selfish, greedy people, who do not care about anything other than profits. Vote Democratic on November 2, 2010. PLEASE!